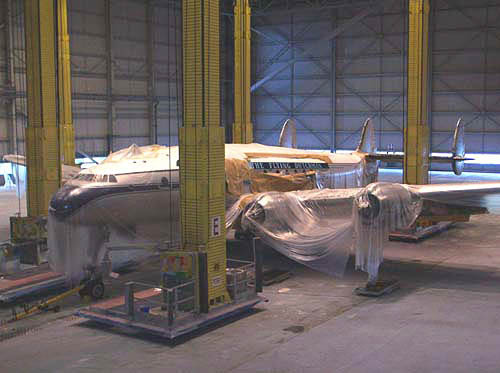 After the arrival of N749NL at Lelystad in September 2002 it was flown to Amsterdam IAP the same day for further restoration. Two years ago restoration was started at Avra Valley, near Tucson,Arizona and it would take almost another two years before the next flight would be made: 02nd of July 2004. 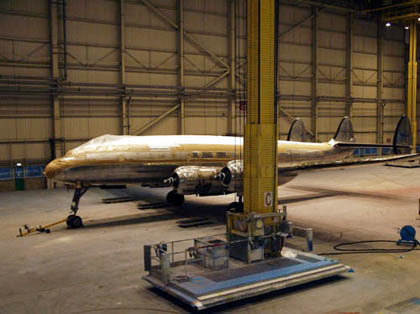 In Dec.2002 I came across the Connie all covered up in plastics in the paintshop of KLM, hangar 14. KLM had started a change of livery itself and it would take numerous small steps before, in between respraying KLM aircraft, the Dutch Connie would get its full 1950s periidoc livery. 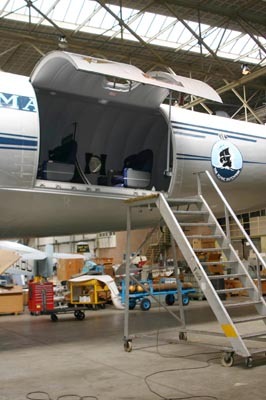 The ramp in front of the Connie is a workstation that can 'float' around an aircraft. 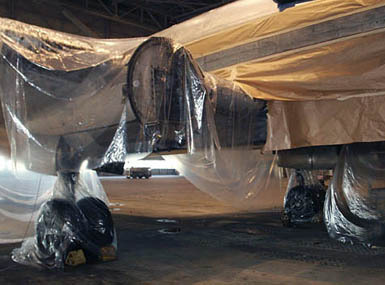 Another shot of the "Queen of the Skies", all covered up (30Apr03). 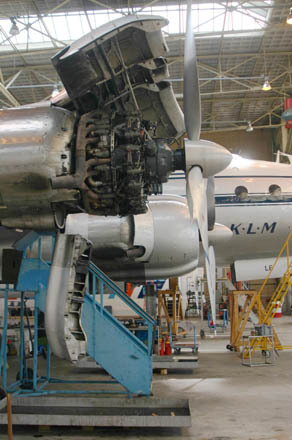 After the ferry flight to the Netherlands the leased propellors and no.3 engine were returned to the owner, Constellation "MATS Connie" Group in Arizona. And the Aviodrome was left with the task to find replacements. 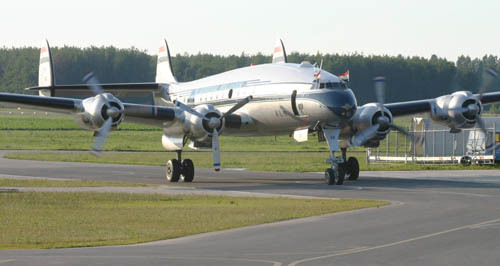 This Lockheed Constellation was originally built as a VC-121 for the USAF, with electrically adjustable propellors; this variant was abandoned for the commonly used hydraulically adjustable props. The engines were fitted with a system to modify it accordingly and since the electrically adjustable props were rare and impossible to find, the modification was performed as such. It makes finding spare props easier too. By May 18th (2003) much progress had been made. 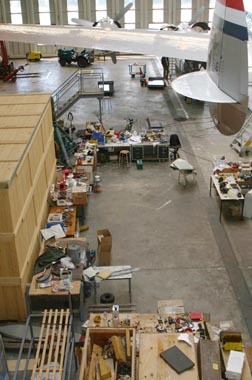 From here the aircraft was moved to Hall 13 in the Fokker Aircraft Industries complex. 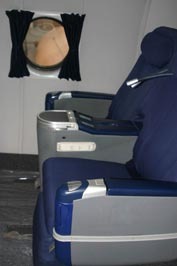 Although being kept informed on various stages of progress, an actual photo-visit to the "Dutch Connie" did not materialize until Saturday June 19th, 2004. Again I had the pleasure to sniff the oil-perfumed air and check the progress in Hall 13. I am forever in awe of the energy and perseverance displayed by the members and volunteers working on this project. I was also very aware of so much aviation history in this hangar, Dutch aviation production history which has preceeded the completion of the restoration of "the Dutch Connie" here. 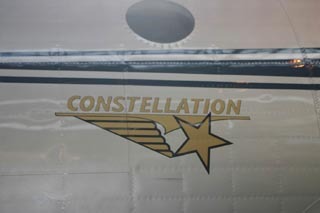 A decal with the name of this aircraft has been put in place, obviously for the convenience of less informed people among the crowds and indeed crowds will gather to see and admire this "Queen of the Skies" perform at Air Shows for many years to come. And people now working on this vintage transport will walk among the crowds and silently glow with pride and pleasure...! No.4 engine is still open for some more "TLC - Tender, Loving Care...."
The Dutch have a rich history, as a seafaring- and trading nation. 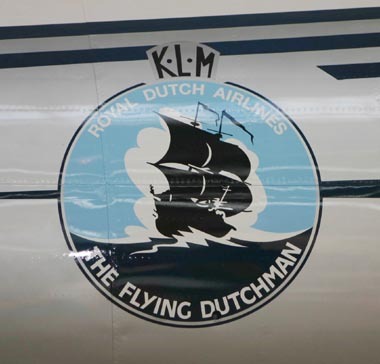 The KLM Royal Dutch Airlines have a rich history and are the oldest surviving airline operating under the name it was founded with. 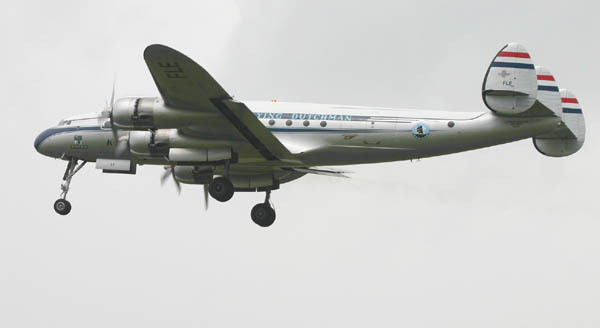 Many pioneering feats have been accomplished and KLM was quick to order the Lockheed Constellation. It only goes to show that you don't have to be a big nation to accomplish great feats and this projects fits well in that tradition. Through the cargodoor the interior can be seen. The seats look phantastic and they should: they were taken from the Business Class section of retired by KLM (sold for 1 Euro to the Aviodrome) PH-BUK. The Boeing 747-206B PH-BUK is parked at Amsterdam IAP and awaiting dismantling for transport to Aviodrome's Aviation Themepark for preservation. The Aviodrome is currently gatherings funds to transport this huge jet. An overall view of Hall 13, former Fokker Aircraft Industries hangar at Amsterdam IAP. 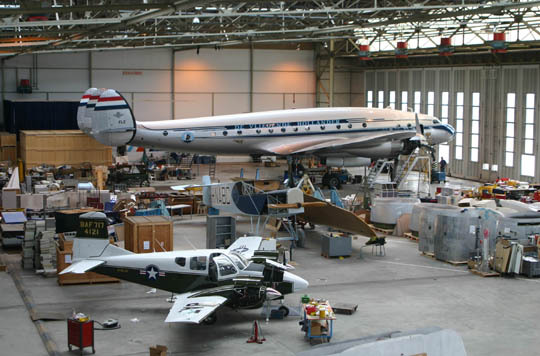 Constellation "PH-FLE" dominates 2 other restoration projects: in front the Beech 95 Travel Air, which is painstakingly restored by Marc Westenberg (Aviodrome's DC-2 crewchief); anno 2004 this plane is 47 years old.... It's tailnumber is N195JR, but a fictional "BAF7174121" has been painted on the tail. The other project concerns a Fokker F2, which dates from 1920 ! It could carry 4-6 persons and was KLM's first true passenger airplane. Another shot of tables full of tools and spareparts; so many little things need to be replaced and what is more, under modern maintenance,: meticulously archived and documented. Sander Raaphorst has the fire-extinguisher close at hand, while no.4 gets a run. Soon everything was found satisfactory and N749NL was pushed inside the hangar again: William Groot drives the little tractor while Sander and Willem Honders walk the wingtips. Arie Groen made this postcard available to me, showing KLM's Connie PH-LKR (cn4502) "Electron". It was mailed by his brother in 1958 ! 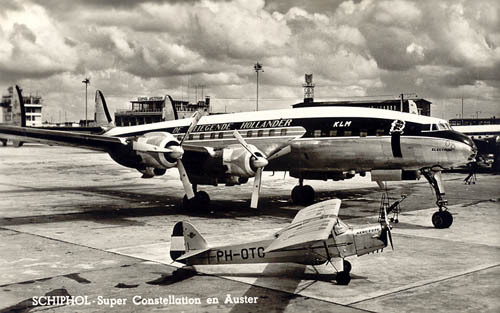 It shows the largest and smallest aircraft at that time with KLM: the L-1049 Constellation and the Auster Autocrat (used for cartography) PH-OTO. This Connie joined KLM (10Jun53) as an L-1049C and upon modification the designation was changed to L-1049E and registration changed from PH-TFR to PH-LKR (24Feb54). And scrapped in 1962. The backdrop is, what is now, Schiphol-East (Amsterdam Int'l Airport's maintenance area) and the tower on the left, partly obscured by the tailfin, has been moved a little and is now a restaurant. I think it was a good idea to preserve that landmark, next to the preservation of historic aircraft. On July 02nd, 2004 the moment was there: 1st flight in the KLM livery ! Click on the image to see and read more on this event ! "PH-FLE" taxies in towards the ramp and the crowd gathered to meet and greet the Dutch Connie to its homebase Lelystad. 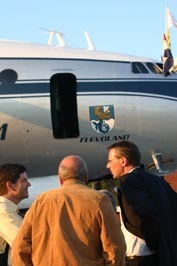 Arno van der Holst (right), Director of the museum, relaxes in congratulatory conversation after the ceremony in which the name of the aircraft was revealed: Flevoland. The celebration was slightly marred by the fact that N749NL had arrived at Lelystad the day before, with no.3 engine running hot on a testflight, requiring the engine to be shut down and the prop to be feathered. It was not possible to get it repaired in time and so the crowd did not see it flying, which was a great pity. 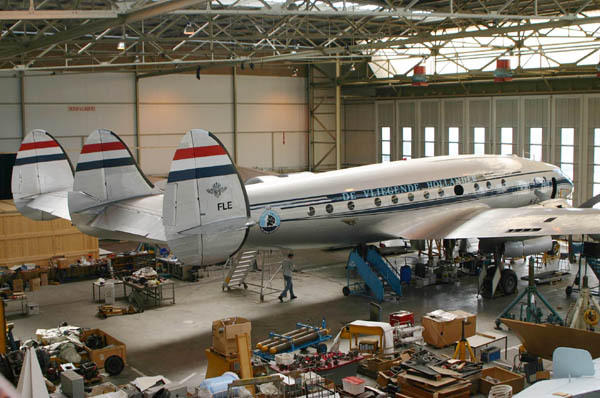 After some 4 years of intensive restoration this Lockheed L.749A Constellation has been restored from a disgarded airframe to a, once again, proud airliner that could be rightly labelled again with its nickname: the Queen of the Skies ! 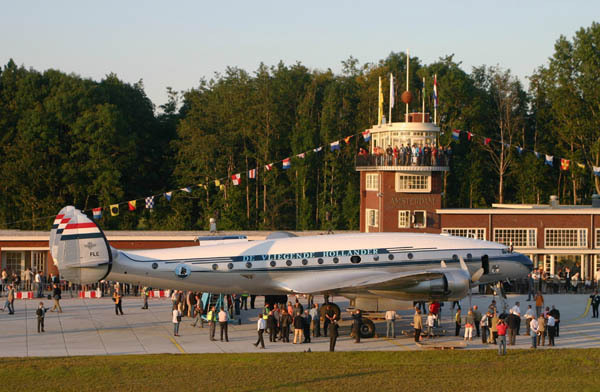 For all those gathered to see this giant propliner "arrive" on the ramp of Amsterdam Municipal Airport at Lelystad truly a day to celebrate. A job well-done by the people of the Aviodrome and the many volunteers, something to be rightfully proud of, congratulations ! Unfortunately, events took an adverse turn.. The problems with no.3 engine brought things to a halt; crew training was delayed and then the global financial crisis of 2007-2008 raised its ugly head. The last public appearance where 48-612 showed its props turning was in 2006, I believe (see below link). 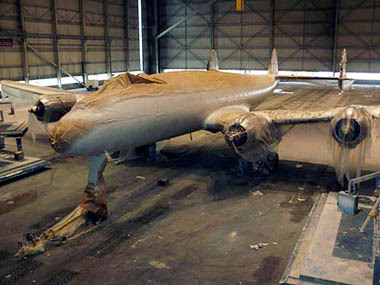 It has since been on display inside the Aviodrome since then and for quite a while work on it continued with hopes of it ever to fly again. But then the Aviodrome got in difficulties itself and ‘the museum with flying aircraft’ was grounded to a more realistic approach, a museum with aircraft on display. Connie's Comeback ! ", the arrival from the US at Lelystad in Sep.2002. Big Budworm Sprayers, by Stephen Piercey (a task performed by N749NL in a previous "life").